Lionel Sanders has started of his 2016 season with four straight IRONMAN 70.3 victories. 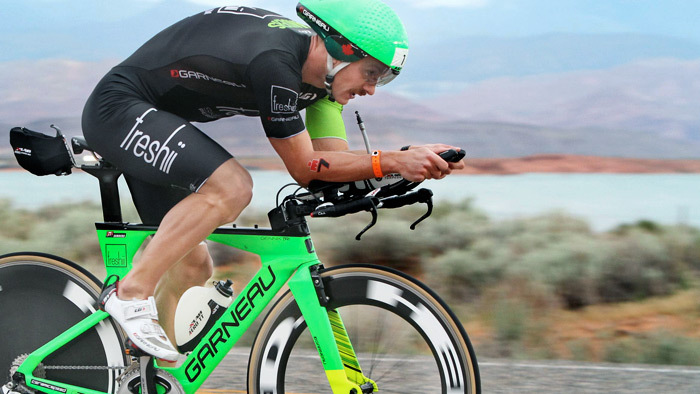 His latest victory at the 2016 IRONMAN 70.3 North American Pro Championships in St. George, Utah was perhaps his most impressive as he bested a strong field of contenders, taking the win by almost three minutes. Sanders exited the water four and a half minutes back of the leaders and proceeded to ride his way to the front. Not panicking, Sanders approach to the bike course was to ride steady early on and be prepared for the harder sections that come later in the bike course. “I tried to be patient for most of the day,” he commented after the race. Still, Sanders was riding through the field and catching everyone, including bike powerhouse and 2014 IRONMAN World Champion Sebastian Kienle. After the climb and with a mostly downhill ride to the finish, Sanders again made a smart decision. “Once to the top of the canyon it is a pretty steep downhill, and I am not the greatest at holding high cadence, so I eased off a bit and tried to get some nutrition in,” he said. Sanders rode a 2:03:57, the fastest bike split of the day, to come off the bike in the lead. View Sanders’ full PowerTap file here. For the full 56 miles, Sanders averaged 352 watts, or 4.70W/kg at 26.9mph and 88rpm. His Training Stress Score® (TSS®) was 170.1. Over his ride, Sanders had a Variability Index (VI) of 1.03. This means that despite the hilly course, his power output was very smooth with only a few big spikes in power to pass other riders. His Intensity Factor® (IF®) was .91, which is what we would expect from a top male professional. During the 41 miles preceding the Snow Canyon climb, while staying patient as he said, Sanders still averaged 361 watts, or 4.82W/kg and averaged 27.1mph with an average cadence of 88rpm. Snow Canyon is 4.36 miles long and gains just over 1,000 feet in elevation. It took Sanders 16 minutes to get to the top, averaging 382 watts, or 5.10W/kg at 79rpm and 16.4mph. He also set his Peak 20, 12, 10, 5, 2, and 1 minute values during this climb. Sanders reached his peak speed of 51.2mph on the descent from Snow Canyon. From the top of Snow Canyon to the finish, Sanders relaxed his effort slightly and averaged 270W for the final 9.5 miles. Sanders had the fastest bike split of the day with a 2:03:57, two and a half minutes faster than the second fastest bike split by Sebastian Kienle. His time is even more impressive when you consider the 3,300 feet of elevation gain. The hills that make up the bike course continue to challenge athletes on the run course as well. “The run is very challenging. The first three miles are all up hill. It was mentally very taxing,” recalls Sanders. In addition, Sanders felt pressure from German Sebastien Kienle. “He [Kienle] was only 30 seconds down for nearly the first 10 miles. I was running scared the whole time. I tried my best to keep the pedal to the medal but I couldn’t shake him,” Sanders said. The constant pressure meant that Sanders never really let up, and his file shows that. His average pace is only 4 seconds faster than his NGP, showing a consistent pace no matter the grade. Illustrating this is the fact that Sanders ran a 5:24 per mile pace over the final 2.5 miles. Sanders posted the fastest run split of the day, clocking a blazing 1:13:30 run and taking the win to become the 2016 IRONMAN 70.3 North American Champion. View Sanders’ full run file here. During the first three uphill miles, Sanders averaged a 6:01 per mile pace. However, his Normalized Graded Pace (NGP), which take the elevation gain into account to show what his pace would have been on flat terrain, was 5:25 per mile. His fastest mile was a 5:10 that was set between mile 4.25 and mile 5.25. Interestingly, his NGP was 6:06 . Running hard to the finish, Sanders averaged 5:24 per mile for the final 2.5 miles that were at a negative 3% grade. For the 13.1 mile run, Sanders’ average pace was 5:39 per mile with a cadence of 93. His IF for the run was .89, meaning he held 89% of the maximum pace he can hold for one hour. His rTSS score was 105.8. While it may look like Sanders hammered the bike, the truth is that he paced it within his abilities. This is not only evidenced by the bike numbers, but also by the fact that he got off the bike and had the fastest run of the day. This points out that every athlete, especially the professionals, rely on smart bike pacing to leave enough in the tank for a solid run.